Six Until Me. : Team Green. 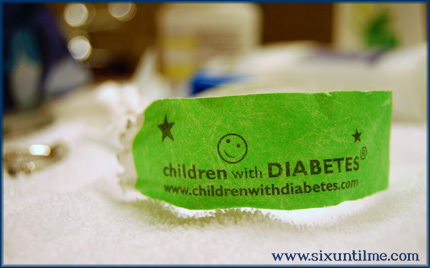 Team Green can't function without Team Orange - the members of our immediate and then extended family who wear the orange bracelets and live with diabetes, albeit from an insulin-producing vantage point. (And I'd be lost without Team Orange.) For me, my Team Orange includes my daughter, who is very slowly learning the bits and pieces of what diabetes means to her mama, and my husband, who manages this condition alongside me every day. It includes my mom and dad, who learned about type 1 diabetes and then helped teach me how to live with it. And it includes the friends I've made along the way - the ones I've made for life - who understand that even when this bracelet falls off, I'm still wearing it. I'm still part of Team Green. Thank you, Friends for Life, for giving me another week where diabetes is "normal." I work at registration...where we give out the coveted bracelets! At one point a parent came by asking for another green and a 'normal' orange bracelet (they do get a bit gnarly after a few days!). Anyway, I looked him right in the eye and said, "here at FFL, GREEN is normal!!" He thought for a second and got this big smile on his face and said, "yes, yes it is...and I wish it could be all year round...can I take some extras for home?" 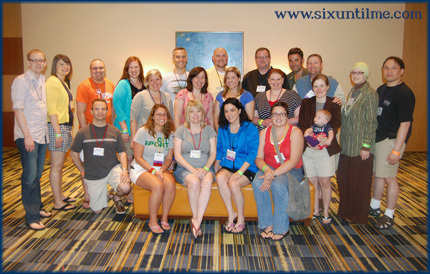 I love working in registration but don't always get out to meet everyone...sorry I missed you Kerri! 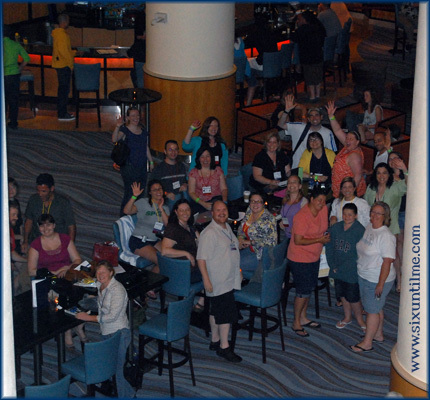 Looks like a great time, Kerri! Those photos are awesome, and I love how you describe Team Green, where D is normal. Makes me feel all D-camp lovey. Looking forward to reading all about the fun at FFL! Thanks for keeping us all in the loop. I think I love Team Green almost as much as I love Team Orange. Or maybe I love Team Orange almost as much as I love Team Green. Oh heck, I love both teams more than I can say!! So honored to be on team orange and be surrounded by such amazing folks on team green! It was so amazing getting hang out with everyone! Team Green is DA BOMB! It was such an awesome week :) So awesome to get a real life green hug!!! !